PARP1 is involved in programmed cell death (apoptosis) and necrosis as well  (Fig. 12.2). PARP1 is cleaved in two parts by caspase 3, a 25 kDa fragment consisting of DBD N-terminal and an 85 kDa fragment consisting of the AMD and CD C-terminal fragment. As shown in Fig. 12.1, when the DNA-binding domain separates from the automodification and catalytic domains, PARP1 becomes inactive and consequences of apoptosis occur. On the other hand, the short fragment, N-terminal, inhibits other uncleaved PARP, then restrains the activation of PARP1 by cPARP resulting in more consumption of NAD molecule, energy depletion, and necrosis . As shown in Fig. 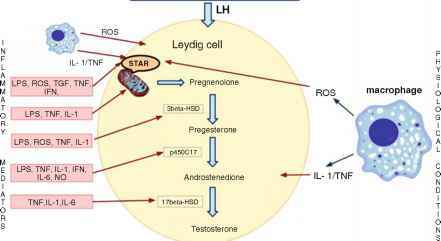 12.2, exogenous agents such as ROS or a genotoxin may cause DNA damage in a cell. 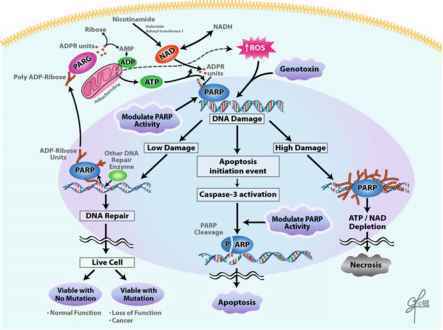 PARP may act in one of three ways: (1) if low DNA damage occurs, PARP can gather the other repair enzymes and repair DNA damage, (2) if high DNA damage exists, PARP is overexpressed and results in ATP/ NAD depletion and necrosis, and (3) after DNA damage and initiation of apoptosis event and caspase-3 activation, PARP cleavage occurs  . Hikim et al. proposed that exogenous agents can activate caspase-dependent cell death pathway. They showed that by increasing scrotal temperature in rats over time, the cascade signals in the mitochondria-dependent cell death pathway including relocation of Bax, translocation of cytochrome C, caspase activation, and PARP cleavage were demonstrated . In support of the association between PARP and caspases, Codelia et al. reported that using a caspase-8 inhibitor and a pan-caspase inhibitor, cPARP decreases and a reduction of germ cells apoptosis takes place .